I love tinkerbell! thank you so much! Thanks so myc - Another really cute kit! I've been searching and searching in the hopes of finding something cute that's Tinkerbell. This is beautiful, thank you so much for sharing! omg this so perfect for my girl's birthday party god bless you !! Thanks so much for all that you provide. This is great! How do you modify the invitation? you can customize the invitation in any photo or image editor or you can use word office. Hola soy de Argentina y me gustaria comprar tus kit pero nose si puedo comprarte por favor espero tu respuesta gracias! This just relieved sooooooo much stress for me! 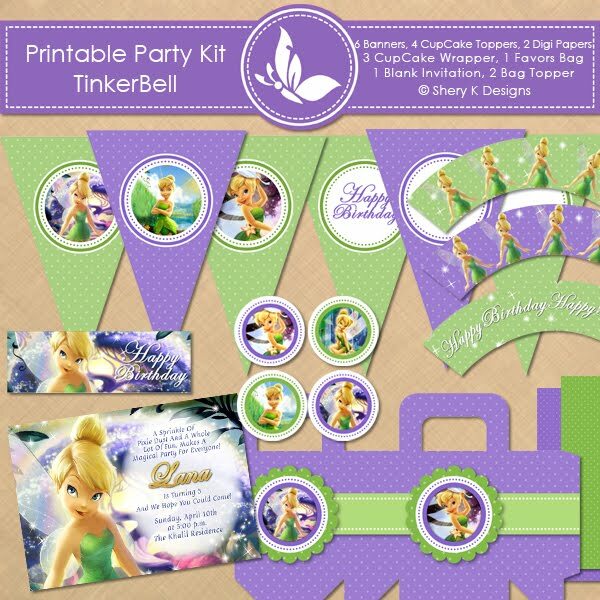 Seeing your printables completely made my day and my daughter will be sooooo excited to see her favorite character in the party colors. Absolutely perfect! Thank you so much! wow this is really great stuff!! thank you so much! exactly what i need for the tinkerbell party.